Components from F1 cars - especially championship-winning F1 cars - don't go to waste. Collectors eagerly snap them up and put them on display as fast as the teams will release them. But in this case, the motor oil from Lewis Hamilton's title-winning McLaren-Mercedes MP4-24 was used to create a tribute to the driver. The painting you see here (at right, click to view in high resolution) was commissioned by ExxonMobil from David Maculuso, who has been painting with recycled motor oil for several years. Macaluso describes the F1-spec Mobil 1 that ran through Hamilton's Mercedes V8 last year en route to the title as an ideal medium, the engine dirt suspended in the viscose giving the final work unique texture and depth. A limited run of 50 lithographic reproductions will be offered to the public, while the original will be displayed at ExxonMobil's pavilion at the upcoming British Grand Prix at Silverstone, which conveniently coincides with National Oil Check Week in the UK. Details in the press release after the jump. 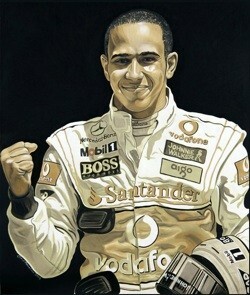 Oil Painting: Lewis Hamilton rendered in used Mobil 1 originally appeared on Autoblog on Mon, 08 Jun 2009 18:29:00 EST. Please see our terms for use of feeds.